What is taking the place of those jobs? It’s a question that politicians and occupational researchers ask all the time, although they know the one clear answer: Information Technology. Computers have been in existence for decades now, and the wise got involved in the industry on the ground floor. Today, IT work includes all of the labor involved in getting the internet to as many people as possible and providing technology support and innovation to every single company in the world. IT work is a lucrative field, and the people who are smart enough to work in that industry are accruing significant wealth. Those who have been in the field since the get-go have done well for themselves over time. Today, financial providers and advisors find themselves working with people from the information technology field all the time. They are significant clients with sizable portfolios who need attention as they enter new financial stages of their lives. And today, many IT professionals are at the stage where they consider retirement. Because they worked in a field that was so vastly different than those people who were in manufacturing, retail or education, for example, they need particular attention to the details of their background. Spectrem’s upcoming Perspective Get Up To Speed with Information Technology Investors examines the investment decisions and financial background of people who work in the Information Technology field and finds they are different in many ways from investors in other occupations. Investors from the IT field are likely to be wealthy. From the Spectrem study, 64 percent expect to have more than $1 million in investable household assets upon retirement. That is well above the percentage of investors from other occupations. Considering their anticipated wealth level, it is revealing that a higher percentage of IT investors worry about retirement than do investors from other occupations. 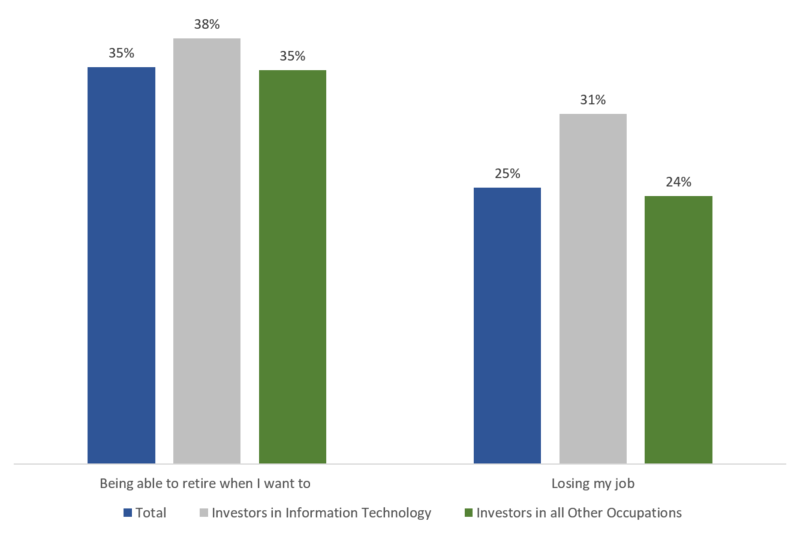 Asked whether they are concerned about being able to retire when they want to, 38 percent of IT investors agreed, a higher percentage than those investors from other occupations. At the same time, 31 percent of ITs worry about losing their job, compared to just 24 percent of investors from other occupations. Asked to place their concern over depleting retirement funds early on a 0-to-100 scale, the IT investors placed it at 35.32, well above the 30.67 average. So IT investors enter the discussion about retirement with concerns about being able to do what they want in regards to retiring, and about maintaining their current employment situation over time. This makes them perfect candidates for an advisor to work with to protect current assets and to perhaps allay some fears they have regarding their retirement plans. Unfortunately, the study shows that IT investors are less likely to regard advice from their financial advisor as much as other investors do. Asked to place their regard for the help of different people in their lives on a 0-to-100 scale, IT investors place their regard for financial advisors at 59.80, below the average of 62.76 for all other investors, while at the same time having a much higher regard comparatively from advice from co-workers (26.85 to 21.98 on average). Like all investors, they have the highest regards in terms of the helpfulness of their spouses. From an advisory standpoint, there are reasons to look forward to working with IT professionals. They consider themselves much more knowledgeable about financial products and investments than other investors (84 percent say they are either knowledgeable or very knowledgeable compared to only 79 percent of others) and 35 percent consider themselves either aggressive or most aggressive in terms of investment risk (compared to 25 percent of others). The IT field is probably going to continue to grow, and the number of investors retiring from the field of IT is likely to grow as well. Advisors can serve IT professionals well by understanding the pressures and concerns they feel regarding their investments and their retirement status, which the Spectrem study outlines.